Hygrobac filters are low dead space filtered HME's. Hygrobac filters have a low dead space and are lightweight to reduce the "drag" on the patient circuit. A gas sampling connection is included. 352U5877 Hygrobac S Filter/ HME Adult, recommended for tidal volumes greater than 150ml. 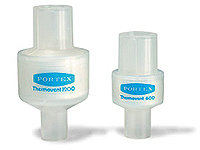 PORTEX THERMOVENT - Portex Thermovent HME�s are a low dead space HME that recovers approximately 75% of the energy and moisture that would otherwise be lost through respiration.